Are you sure you want to buy a condo? Find out the pro’s and con’s first before continuing in the process. First and foremost there are glaring differences when you buy a a condo versus a single family. A condo is similar to an apartment except that you own it. You will also have neighbors close by that will share walls with you. I personally feel that it is more of a starter home and also can be great for empty nesters but this will depend on your lifestyle. If you live in the Midwest you know we have snow in the winter, one of the perks in having a condo is that you don’t have to worry about snow removal or any yard work. All the maintenance is covered under your HOA dues (this will be explained in the con section). Depending on your life situation this can be something that will keep you stress free which is a positive. I just recently had a buyer that is a teacher and is single and she doesn’t want to deal with the hassles of cleaning snow nor mowing a lawn since she is a busy bee with her students. The costs of a owning a single family home can be pricey. Condo living can be relatively cheap compared to the expenses of a home. Let’s now forget that as an owner of a single family home you have to make sure the gutters are clean, the roof is in good shape, the furnace & water heater are running properly, the plumbing has to be in order, god forbid if you get flooded – should I continue 🙂 These things can be an expense price to pay. Although you do have mechanicals in a condo but less to worry about in terms of maintenance. One of my buyer’s Tony bought his home and 2 months later needed to replace the whole roof because there were defects found. Security and amenities – if you get a condo in a high rise most likely there will be a doorman and these guys are great. There duties almost always center around helping residents as they arrive or leave. The doorman is typically on call to assist guests or residents, helping to keep them satisfied. A doorman will hail taxis, sign for packages, give directions and keep an eye out for suspicious activity in and around the entrance of the building. Being alert and keeping the entrance safe are perhaps the most important duties of a doorman. If you are a single gal or guy security will be crucial. The amenities come in handy as well. Want a pool? A fitness center? Wednesday game nights at the community clubhouse? Many condo communities offer residents amenities that are out of reach for the average homeowner. Now here comes the downfall of owning a condo.. Lack of privacy – since condo living is like being in an apartment sharing walls with your neighbors might not be your cup of tea especially if the walls are super thin. You also might not have peace and quite since you are sharing the space with other people they might be nosy and loud. This includes neighbors going up and down the halls at all hours of the day and night. One of my clients said that her upstairs neighbor had a dog that every time someone would walk through the hallway it would howl like a wolf. Boy! I bet that got tiresome. Resale value – most people look for homes and don’t even think about buying a condo depending on the age bracket or your life situation. 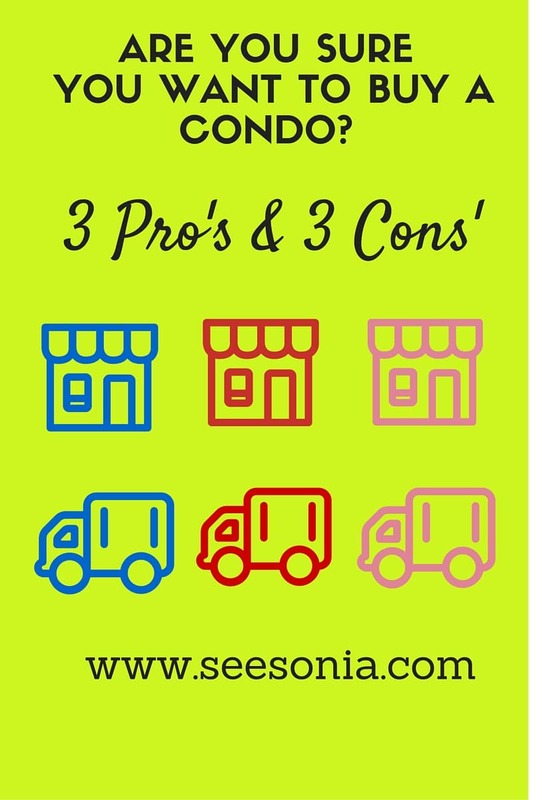 Condos are a tough sell because they all look alike and most people want a back yard so on the re-sale end it is usually a tough sell unless you are located in an area where the market is hot. These sought out area’s tend to be by big universities and colleges. HOA – the good old Home Owner’s Association dues, these fees can sometimes be a deal killer depending on location these fees can sometimes range up to $1,000 a month. When you buy a property governed by a homeowners association, you automatically become a member of the association. You don’t have the choice of not joining. The purchase of your home becomes a contract with the HOA. You agree that you’ll obey all the HOA rules. The fees can be expensive and increase when extra money for maintenance is needed. Homeowners share in the decision making process in regards to the condo building. While many owners seek the sense of community and safety found in condos, some buyers do not like the homeowner’s rules and restrictions associated with condos. So if you are in the market for a condo be sure you are ready to buy one, do you think you are ready?